"The food thus offered to God is digested by 'Vaishwanara" in the digestive system. Since God exists in the form of fire as Vaishwanara, He digests the food along with the impurities. So, man will not be affected even i the impurities enter the food." When i was in Brindavan in May this year, i had the opportunity to attend the morning talks at Sai Krishan Kalyana Mandap. On one of the days Uncle Prahlad Rao gave a talk and he covered the potency of the food mantra stated below. In the early days (70s if i recall) Swami had asked all the Brindavan campus college boys to join Him for lunch. At that time only about 100 boys were there. Kirlian photographer, Dr Baranowski was also there and was invited for lunch. The sumptuous food was laid out on plates in front of the boys. The boys were waiting for Swami to come and join them. Dr Baranowski then used his Kirlian camera and took photos of the food laid out on the plates. There was no aura found around the plates of food. Later Swami arrived and joined the boys for lunch. The boys recited the Brahmaarpanam mantra before partaking the food. After the food mantra was recited, Dr Baranowski again took pictures of the food. This time, blue aura was found around the plates of food. He was excited but yet having a scientific mind asked Swami on the reason for the blue aura around the food. 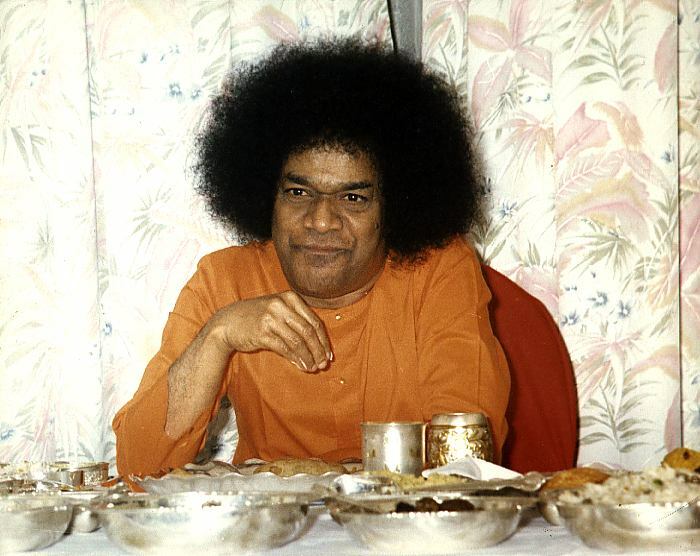 Swami said that the Brahmaarpanam mantra is a very powerful mantra and that after recitation, the food is converted to prasadam, as it has been offered to God. It further purifies the food and all items around it. Thus, the blue aura was found around the plates of food after the mantra was recited. The whole creation being the gross projection of Bramham, the Cosmic Consciousness itself; the food too is Bramham, the process of offering it is Bramhan; it is being offered in the fire of Brahman. He who thus sees Brahman is action, reaches Bramham alone. Reference: Daily Prayers to Bhagwan compiled by Smt. Kausalya Rani Raghwan.